A luscious, decadent pudding recipe that is to die for. 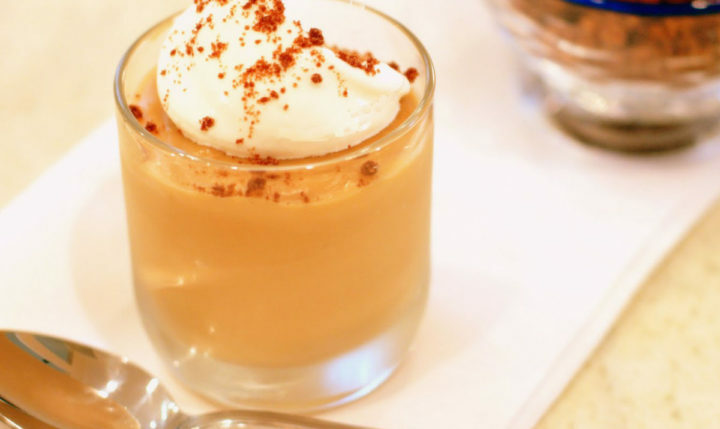 The bourbon whipped cream is a perfect complement to the caramel flavors. Add the heavy cream to a small saucepan. Split the vanilla bean with a small knife. Scrape the seeds into the saucepan and add the pod too. Set heat to low. Slowly warm the cream. Pour all but 2 tablespoons sugar and the 1 1/2 tablespoons of water into a heavy-bottomed saucepan. Set over medium heat, swirl until the sugar dissolves. Turn heat to high and let the sugar mixture boil but don’t stir, until it turns dark amber, about 4 minutes. Watch closely this process happens fast. Reduce heat to medium. Take the vanilla pod out of the cream mixture and slowly stir the cream mixture into the caramel. Let it come to a boil, remove from the heat. Let cool about 10 minutes. In a medium bowl, whisk the egg yolks with the left over sugar and a pinch of sea salt. Whisk in a small amount of the liquid mixture into the egg yolks, then gradually whisk in the rest until it’s all added and incorporated. Strain the mixture and pour it into four 6-ounce ramekins. Place ramekins in a shallow baking pan filled halfway up the ramekins with cold water. Cook for between 1 hour to 1 hour and 15 minutes, until just set. Chill pudding for 3 hours or more. While the pudding is chilling, whip the whipping cream using an electric mixture. When it’s close to being whipped, add the bourbon and powdered sugar. Continue whipping until fully whipped.